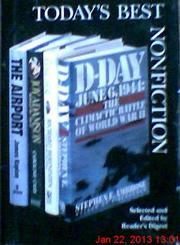 A splendid, moving, and authoritative account of the most decisive day of WW II by Ambrose (History/Univ. of New Orleans), whose massive biographies of Eisenhower and Nixon have won widespread praise. Based on "the most extensive first-person, I-was-there collection of memoirs of a single battle in existence," Ambrose moves easily between the strategy of each side and the individual recollections of the battle. He conveys not only the magnitude of the enterprise but its complexity. He also suggests some significant changes to the conventional interpretation of the war, most notably in the view hitherto taken about the respective quality of leadership and soldiers on each side. He contradicts the belief in the superiority of the German soldiers and says that the higher losses they inflicted against the Anglo-American armies derived from the necessity for the latter to take the offensive. The German army was, he writes, "inferior in all respects (except for weaponry, especially the 88s and the machine guns) to its allied opponents." He call Rommel's plan to stop the Allied invasion on the beach "one of the greatest blunders in military history," and he compares the strategy to that of the French Maginot line. By contrast, he argues that Eisenhower's judgment was generally right and that he not only inspired his subordinates but also showed courage in rejecting suggestions for an alternative strategy from Army Chief of Staff George Marshall. But most memorable in the account are the tales of individual heroism, from the 16-year-old French girl who, with a group of companions, paralyzed the German Second Panzer Division by removing the axle grease from its transporters and substituting an abrasive, to the Canadian soldier who threw himself down on barbed wire to enable his companions to use his body as a ladder. A brilliant account that blends perfectly the human and the strategic dimensions of this great battle.